"Behold, gentlemen, the Tombs of the Cybermen." "Tombs? I don't see any tombs." "There, Jamie. Frozen forever. All their evil locked away with them. And so it must remain." "The Tomb of the Cybermen" is a seriously big deal, arguably the critical serial for the Cybermen. Hugely popular but, like many others in the black and white era, thought lost to the BBC's cavalier wiping of its old tapes, Whovians the world over rejoiced when telerecordings of all four episodes turned up in 1991, in the archives of a Hong Kong station that had received them for broadcast more than two decades earlier (such overseas copies turning up account for the bulk of the once-lost episodes that have been recovered). Just as well they did - Matt Smith's Doctor was going to dress more like Jack Sparrow, until Smith watched "Tomb" on DVD as part of his research into his new role, phoned Doctor Who supremo Steven Moffatt to rave about it for twenty minutes non-stop, then demanded his costume include a bow tie. The Cybermen discovered in their cryogenic tombs on the distant world of Telos were little different from those that had attacked Earth's moonbase one season and five hundred years earlier - costume maker Sandra Reid had done a thorough overhaul of Cyber fashion then, to satisfy producers looking for something more robotic and sleek, and no one saw any need to go back to the drawing board once more. 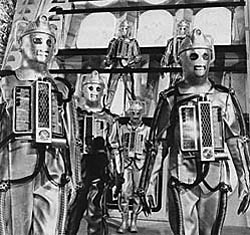 The new Cybermen - Cybertelosians, as David Banks's Cyber family tree would dub them - wear a much smooth, better-fitting silver suit, including three-fingered gloves, and true exoskeletons over their limbs (made from rubber tubing and hollow practice golf balls). The chest and head units also remained unchanged - the only major modification was to rearrange the tubes emerging from the chestpack, streamlining the shoulder tubes and adding matching pairs running to the exoskeleton hips. The figure's sculpt is as capable as you'd expect from Character Options, who don't have a history of mucking up - the bodysuit is smooth and far less wrinkled than the "Tenth Planet" version, though true to form it still creases here and there. The big feature is the exoskeleton, which has been devised with some care so as not to damage itself or limit articulation. Rather than having the tubes secured to limb-mounted joints, as in the actual costume, the figure attaches the rods via long plug-ins beneath the tubes themselves, leaving the golfballs - sitting above the figure's joints - the maximum available freedom of movement, to keep them from having to bend sharply and risk tearing when the figure is posed. The thinner tubing connecting the major exoskeleton rods to the chestpack is softer rubber, except the tubes that run from the shoulders across the upper back and in beneath the helmet - they're sculpted on, with a visible gap where the arm joins the body at a swivel joint. As a result they don't look as good as the rest of the structure, but from the front they're not easy to see anyway. The chestpack, being so central to the costume, comes in for a fair amount of attention itself, although purely cosmetic in this case. The real prop is duplicated in considerable detail, with a central grill section - dark paint with a silver highlight to catch the raised edges - and individually sculpted side units beneath clear covers. At the bottom, harking back to the old dish weapons (though obviously much smaller), is a circular light, and slotted in behind it is a slim weapon. Unfortunately it's built into the chest unit, rather than removable, although to be fair it was barely used in "Tomb" anyway. The heads, though owing a lot of design to the originals, are the most pure-robot feature of the new look. Cast in smooth fiberglass, with only mesh-covered holes for the eyes and mouth (which got reflective tape added to their edges, since they proved difficult to see on camera), none of the old human face forms remain. The head-mounted power dish is now integrated into the scalp plate, but the antennae remain (as they always would), still in clear plastic to resemble the central sections of the originals. As a result of the clever exoskeleton design, articulation is unimpaired - only the head is immobile, as an unavoidable consequence of the helmet/mask's original design (it is a separate piece, but the tight-fitting "collar" gives it no room to move). Elsewhere it's business as usual: swivel shoulders and biceps, pin elbows, swivel wrists, swivel waist, swivel/pin hips, pin knees, and swivel boot tops. The wrist golfballs angle slightly inwards, meaning they look okay even if the hand is turned to be held palm-down when outstretched - handy, since that was the Cybermen's standard pose for zapping foes with a short-ranged electrical attack. Like its comrades in the Cybermen figure series, the Cybertelosian comes with part of the BAF Cyber Controller - two parts, in fact, the torso and right arm. 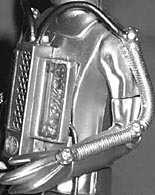 Since the Controller featured in the same episode as this particular Cyberman, the design is similar - the arm is identical, but the torso lacks the chestpack, which the Controller didn't have on his costume. Also from "Tomb" are the Cybermats, a form of mechanical life theorised to be native to Telos, and co-opted by the Cybermen to make a nuisance of themselves by zipping around and biting any humans they came into contact with. Now remembered more as the unconvincing puppets of "Revenge of the Cybermen," the original Cybermats were small bug-eyed critters, animated in a variety of ways, from remote control to wind-up power to being pulled around on strings. The Cyberman has two of these little critters to keep him company, reflecting the two main designs in the not-quite-identical swarm seen in the serial: a small, smooth model, and a slightly larger one with a cilia-like fringe beneath the front of its body. Some of the Cybermat models were capable of "wagging their tails", but these accessories are too small for any such fancy features, and are simply one-piece molds in semi-soft plastic (to protect the antennae from snapping). "The Tomb of the Cybermen", as I said, is a big deal - this model of Cyberman costume was used, with modifications, in three episodes ("Moonbase," "Tomb" and later "The Wheel in Space"), but it's this serial that made the biggest impact, and it's suitable that the Cybertelosian figure is modelled after it specifically; the BAF Cyber Controller is no surprise either. The non-removable weapon is a very minor gripe, and one which doesn't really count for "Tomb" anyway (with the "Tomb"-specific hip tubes built into the gun's component, a "Moonbase" figure would need a new piece anyway, so we may get our removable gun there) - regardless, this is the classic Cybermen figure to get.